Imphal, Feb 12 (IANS) Defying curfew, hundreds of women vendors on Tuesday continued their sit-in protest here demanding withdrawal of the Citizenship (Amendment) Bill 2016. This forced the authorities to partially block internet service in the state. Besides, a group of young men also protested naked in front of the Bharatiya Janata Party (BJP) office near the Manipur University. In a bid to rein in the worsening situation, the District Magistrate of Imphal West ordered to ban circulation of images and reports of the movement via internet. The police had to fire teargas shells and mock bombs to disperse people and prevent them from coming out of their houses to join the sit-in protest. 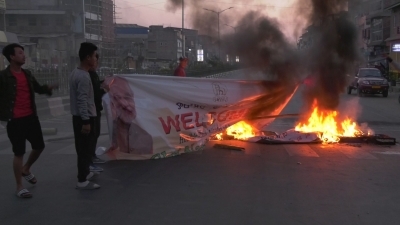 Many of the protesters also burned effigies of the Prime Minister and the Chief Minister, while women took out torchlight marches in various many parts of the state. Meanwhile, Chief Minister N. Biren Singh, who is camping in Delhi, appealed to the people to remain calm as everything possible is being done to halt passage of the Bill in the Rajya Sabha on Wednesday.